Tennis elbow, a pulled hamstring, shin splints or an ankle sprain. We’ve all dealt with common sports injuries in an attempt to get in shape. Faculty at Georgia Tech’s College of Engineering are laser focused on providing sports medicine for even the most common injury. Past that, extracellular matrix therapies, regenerative medicine and wearable joint sensory technology are just a few of their more advanced focus areas. Sports medicine today has become a specialized field with many facets. No longer just a study of orthopedics, sports medicine now encompasses new therapies and technologies that tackle all sorts of sports-related injuries and diseases, leveraging predictive analytics and wearables to keep athletes performing at their best. Tech’s sports medicine research program continues to grow, led by faculty such as Robert Guldberg, Omer Inan, Michelle LaPlaca and Johnna Temenoff, all leaders at the top of the field. Each of these engineers has made impactful contributions to sports medicine research, and their work is already seeing real-world application today. Each one of them is driven by a common desire to enhance the quality of life of athletes, both on and off the field. And even occasional exercisers can reap the benefits. Baseball players today may soon reap the benefits of Robert Guldberg’s work on treatments for rotator cuff injuries, ligament tears and osteoarthritis. Guldberg has recently worked with the likes of Dr. Gary Lourie, head physician for the Atlanta Braves, whose focus is to keep athletes safe and healthy. Lourie will deliver a keynote talk on regenerative medicine at the Major League Baseball annual meeting in December. This close collaboration with Tech brings cutting edge sports medicine therapies to baseball players across the nation, keeping athletes performing at their peak. 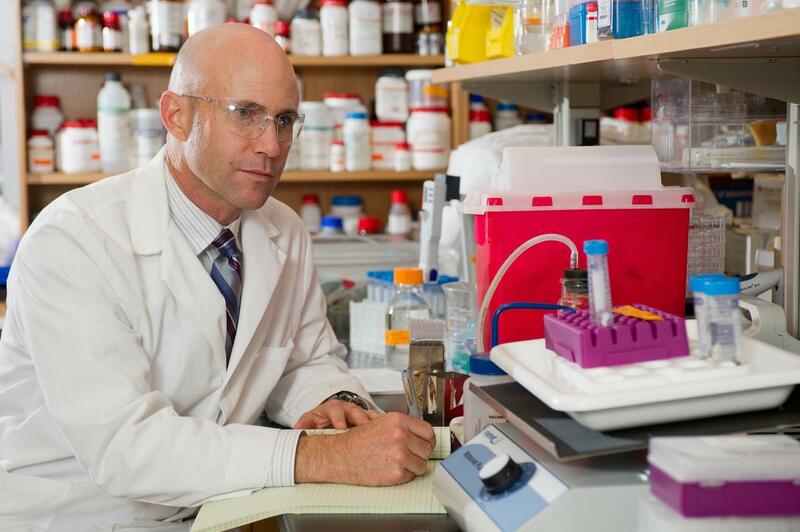 Much of Guldberg’s research can be applied to athletes, like baseball or football players, who have early onset osteoarthritis from trauma to their bones and joints. Guldberg has recently focused on extracellular matrix (ECM) therapies for sports injuries and using stem cells to reduce inflammation and stimulate healing. As one example of an ECM therapy already in clinical use, human amniotic membrane allograft derived from placental tissue contains more than 200 prohealing proteins to make it one of the latest treatment options to help manage sports injuries. Guldberg is also interested in biomaterials and bio-printing for injuries to cartilage like the meniscus. Bio-printing involves 3D printing but with living tissues. Currently, there is no real solution for a damaged meniscus. But in the future, a living meniscus could feasibly be printed. In the meantime, biomaterial hydrogels are used to replace cartilage tissue and speed recovery. When asked about the future of biomedical engineering, Guldberg points to predictive modeling and data analytics. Soon, there will be predictive models for diseases like arthritis, creating the opportunity for doctors to intervene early and stop the damage. Guldberg hopes to be on the front lines of returning athletes and others to full health. Omer Inan was a college athlete in track and field at Stanford when his passion for sports medicine began. As a discus thrower, he became interested in quantifying the health of joints to enable higher performance and influence training regimens. Today, Inan is developing sensor-based technologies to aid the road to recovery in athletes. With pro athletes, training is occurring at a very high level, and the stress on the joints is substantial. Monitoring athletes’ bodies, particularly the joints and ligaments, can help coaches make better training decisions. Objectively-driven decisions guided by data reduce the chance of re-injury and optimize recovery. Inan has developed a Wearable Knee Health System (WKHS) that listens to the sounds a joint makes to determine its health. The WKHS can be used during rehab to monitor swelling and structural stability improvements. It’s creating a much more objective level of monitoring. And it’s not just for knees. When Inan was throwing discus in college with his sights set on the Olympic trials, he over extended himself, cutting his career short. If his coaches had possessed technology like this, it is likely he could have competed much longer and at a higher level. Inan’s work also takes him to Professor. Mindy Millard-Stafford’s lab at Georgia Tech, where he measures heart function in a high heat environment, like a summer ball field or football stadium. Many athletes suffer from dehydration in these conditions, and Inan is looking for a way to measure the body’s reaction based on cardiac response. In the future, Inan is interested in looking at overuse injuries, which he predicts to be the next big thing for joint health monitoring in sports medicine. Inan believes data analytics will help researchers study overuse injuries by quantifying injury risk with wearable sensors. Analytics are helping Inan build better sensors to gather more accurate data. Inan hopes to use analytics for overuse injury detection to help athletes avoid further damage and create a healing regimen to get them back to playing, and fast. Michelle LaPlaca recently gave a TEDx talk on concussions, bringing her research and viewpoints to center stage for a large, engaged audience. In her talk, she makes the case for personalized health to transform the way doctors treat concussion injuries. For each athlete that suffers a concussion, LaPlaca argues you have to take into account any number of personal health factors, such as medication and preexisting conditions. Doctors can then make more objective decisions about concussion treatment and more accurately predict outcomes. LaPlaca believes the next phase for DETECT is to leverage the data analysis to make concussion therapy even more personalized and predictive. Ideally, she would also like athletes to have access to the tools on a personal device, like a smart phone. LaPlaca finds the brain intriguing and challenging, and every day she leverages her bioengineering background to problem solve for the most efficient, yet complex, machine on earth: the human brain. Johnna Temenoff is passionate about making people’s lives better. And she does that with her research into regenerative therapies, which involves injecting cells or proteins into tissue to aid healing and stimulate repair. As athletes age and put more stress on their bones, joints and ligaments, degeneration occurs, which leads to tears to the tendons and ligaments. Temenoff is hoping to identify degeneration and stop it in its tracks, before a tear occurs. Starting this fall, a new NIH grant will enable Temenoff to focus on the idea of intrinsic healing. She’s proposing an injectable material that would recruit the body’s own stem cells to injured muscle to stimulate regeneration. The cells would then prevent further degeneration and potentially promote future regeneration. Temenoff suspects this research will be very useful for sports injuries like rotator cuff tears, a common condition among athletes born from overuse. Temenoff’s rotator cuff research has also detected early changes to the cartilage, so she’s looking to target cartilage, as well as tendons for those who may be susceptible to injury. Baseball and football players, swimmers and throwing sports competitors in track and field can benefit from cartilage monitoring. The regenerative therapies being developed would treat the cartilage with an injection, preventing negative changes to the joint. If a tendon tear does occur, the next question is how best to treat it. Standard procedure is to suture the tendon back to the bone. The biggest issue for athletes in this situation is the inability to return to full function because the muscle is too weak. It is also very easy for re-injury to occur because of the tightness of the tendon. Temenoff has a solution in mind: to completely regenerate the tendon and avoid surgery all together. Temenoff’s hope is that eventually the regenerative therapies will completely prevent the need for tendon reconstructive surgeries or at least provide alternates to allow the body to regenerate if a tear does occur. Temenoff is collaborating with Emory Orthopedics and their physician team to validate her studies. The doctors at Emory lend a unique perspective to the research by providing patient tissue samples. Emory also gains an engineering team who is focused on regeneration that they can eventually use to treat their patients. Temenoff expects this synergy to grow as her research continues.